And I am such a PROUD big sister!!! My younger brother just graduated at the top of his class from Florida Institute of Technology with a degree in AeroSpace Engineering...He is so smart and cool! And of course I had to make a card to go along with his personality...he is one of those good looking, cool kids. He is 6ft 3in blonde, well built and FUN to be with (sorry girls he is taken getting married in Sept). And his school colors are Black and Maroon....so I whipped out this card using all Impression Obsession stamps...the paper is from Basic Grey. 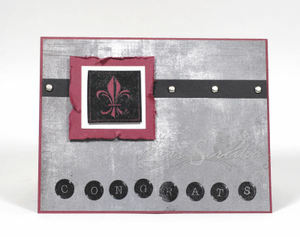 The "CONGRATS" is stamped in Versamark and then embossed in black, as is the Fleur De Leis stamp from the Masculine IO set. :) I have four other cards that I created using this set but I didn't take pictures of them before I sent them to my LSS for display...what was I thinking??? Anyway, you all enjoy!